When you get hungry, do you reach for your phone instead of food? If so, you're not alone. As part of the 2015 POPSUGAR Insights Food study, we surveyed female visitors to POPSUGAR to better understand their grocery-shopping behavior and consumption of digital food content. 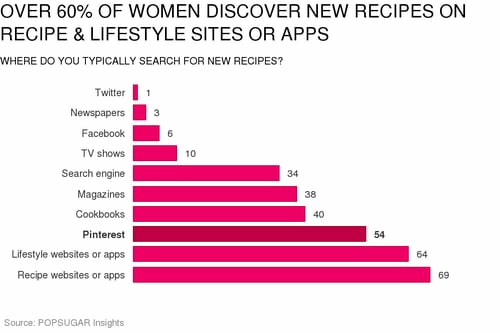 We asked where women typically search for new recipes and found that 69% of women head directly to a recipe website or application, and 64% of women seek out a lifestyle-content website or mobile app. Pinterest ranked third overall, with 54% of women seeking to discover new content via the very popular visual social network. Forty percent of women still like an old-school approach to recipe discovery, choosing to use a cookbook or magazine. Surprisingly, print options ranked above search engines (34%) for our audience. In terms of when women seek out food- or recipe-related digital content, given the choice, over half (51%) of women selected "whenever the mood strikes," proving that the best device for consuming food content is the one within arm's reach.